“A black lad, a Chinese lad and a Syrian lad walk into a wrestling gym”. No, not your grandad’s latest ill-advised attempt at a joke, but the basic premise of Glory, the new play by Yorkshire writer Nick Ahad, which I had the pleasure of attending when it came to Hull Truck Theatre on Tuesday 26th March. Former British wrestling superstar Jim Glory (Jamie Smelt) now runs Glory’s Gym, training the next generation of grappling heroes (babyfaces) and villains (heels). His three latest recruits are Ben (Joshua Lyster), Dan (Josh Hart) and Sami (Ali Azhar), who all have different reasons for joining the gym and wanting to become the next big thing between the ropes. 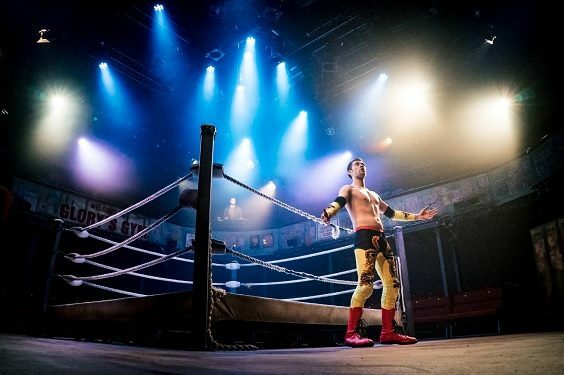 The play uses the backdrop – no pun intended – of the wrestling ring to explore various themes, including racism, multiculturalism and identity, in a heartfelt and often hilarious way. The dialogue is sometimes strong, but never steps over the line, while the fight scenes are exhilarating and clearly very well choreographed. I had the chance to ask Josh Hart, who plays Dan, a few questions about his experience in the play. What first drew you to the role? After meeting up with Anna Nguyen, the producer of The Dukes Theatre in Lancaster, she invited me to come and assist writer Nick Ahad with the Research and Development of Glory when it was in its early stages of its life. It was here I was introduced to Dan. I instantly drew comparisons between Dan’s life and the life of my family, growing up working long hours in a takeaway, and always fighting for acceptance within the community they live in. Glory is a powerful, physical and exciting piece of writing, filled with incredible wrestling. I knew that I wanted to tell Dan’s story. Have you ever worked with any of the Glory cast or crew before? I have never had the pleasure of working with any of the cast before on stage, Jamie Smelt, who plays Jim Glory, was also assisting the team with the research and development we did last summer. Were you a wrestling fan before you read the script? If not, did you research the old ‘World of Sport’ programmes or more modern wrestling such as WWE in preparation for the role? I used to follow wrestling quite a lot growing up. My mates and I would try and re-enact the moves in the garden. I used to love Rey Mysterio and his incredible spins and acrobatic moves. I watched wrestling less and less often as I got older, and other sports and activities took over but I still enjoy it on occasion. In preparation for the role, I watched a lot of WWE. It was interesting to see how much it had changed from when I was a kid, but the principles were still the same. Babyface and Heel. The fight scenes are very physical (and superbly choreographed!). Was this a new experience for you, and do you enjoy it? This sort of wrestling is something I have never experienced before. I am trained in stage fighting, and have dabbled with a few martial arts, but wrestling is a completely new concept. The punches are real, the slams will hurt, and you will get scrapes and bruises. The physicality of wrestling is immense, but I absolutely love it! We were lucky enough to have an incredible fight director, Kevin McCurdy who is probably the most passionate man about fighting I know. Being able to choreograph a wrestling fight was one of Kev’s life long dreams, this, coupled with his wealth of knowledge and an extremely eager cast, provided a pretty good platform to work on. Keeping safe is the main priority, and all actors have to be fully aware and alert at all times. Eye contact, reading each others movements and practice all play a part in keeping the fighting safe and believable. 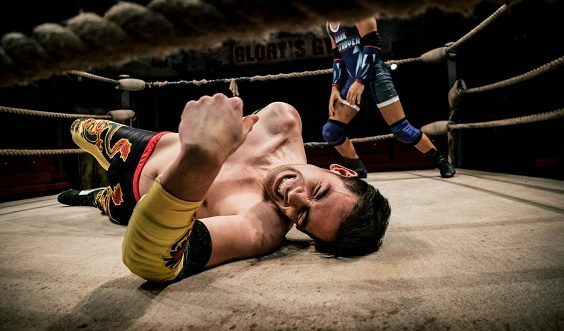 After working on Glory, I have such a new found respect for wrestlers, the extremities their bodies go through is insane! 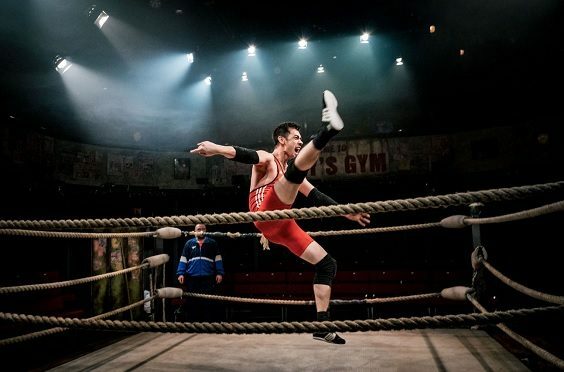 The play uses wrestling as a backdrop for various themes, including race and identity. Was this important to you when deciding on the role? I was lucky enough to be offered the role of Dan very early in the process of Glory, after the Research and Development days I partook in, and was very keen to accept. After working those few days with writer Nick Ahad and director Rod Dixon, I knew that Dan’s journey was one that I wanted to tell. Race has always played a part in my life, whether it being stories that my Chinese Grandparents have told me, or working out how to be accepted in a small town where I was one of a few that weren’t fully white. My Mum always told me of the long hours she would work in the takeaway after finishing school, and the abuse that my family used to get whilst just trying to make an honest living. It was this that really gave me a strong connection with Dan.